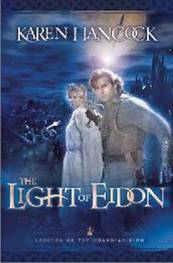 Bethany House Publishers has made special arrangements with a number of booksellers who have agreed to offer The Light of Eidon, volume one in my Legends of the Guardian King series, FREE as an e-book. The offer will begin at midnight September 1, 2012 (or, more specifically at 12:01am) and conclude at midnight on September 30, 2012. The list of publishers that will be in on this special offer can be found HERE at the landing page BHP has created. Scroll down the landing page to find The Light of Eidon’s entry, then click through to your bookseller of choice. If you want to learn more about The Light of Eidon itself, just scroll down on this page for a synopsis, review blurbs, awards and an excerpt. My latest relesase is actually a re-package and re-release of my first novel, Arena, a 2003 Christy Award Winner. I’m super excited that Bethany House has decided to re-release this novel. I really like the new cover they designed for it. Over the years, people have enjoyed this novel a great deal, and I am happy to have it available in paperback for a new generation of readers. Buy Arena at Amazon, CBD or your favorite Christian bookstore. 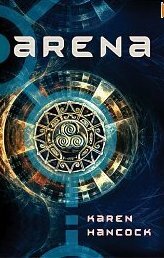 Arena is also available in e-book format. The Enclave – Available from Amazon in paperback and as an e-book. When Lacey McHenry accepts a prestigious research fellowship at the world-renowned Kendall-Jakes Longevity Institute, she sees it as a new start on life. But when a disturbing late-night encounter with a bizarre intruder leads to a cover-up by Institute authorities, she soon realizes all isn’t as it seems. Caught in an elaborate game of deception and seduction, her only ally seems to be the brilliant but absent-minded geneticist, Cameron Reinhardt. A favorite of the Institute’s charismatic director, Cameron, too,came to K-J hoping to escape his past. But the more he learns about Lacey’s attacker, the more he fears that the past still pursues him. Not certain they can trust each other, Cameron and Lacey reluctantly work together to uncover the shocking secrets that lurk behind the Institute’s respectable façade – secrets that turn out to be bigger, stranger, and far more dangerous than either of them could have imagined. Abramm Kalladorne has dedicated the last eight years of his life to becoming worthy to touch and tend the Sacred Flames of Eidon, and he expects to be blessed for his devotion and sacrifice. 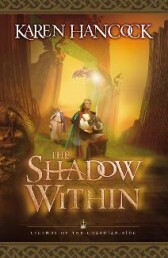 But on the eve of taking the vows that will irrevocably separate him from the life he was born to—as fifth son of the king of Kiriath—he is betrayed by his spiritual mentor and sold into slavery by his brothers Swept along by the winds of a new destiny, Abramm is forced to compete in the gladiatorial games of his new masters. When the oppressed masses rally around his successes, he discovers his suffering has molded him into something greater than he ever thought possible—to serve a purpose he never imagined. After months of conflict and opposition, Abramm Kalladorne has finally stepped into his destiny as king of Kiriath–only to find himself with more problems than ever. The Mataio remains antagonistic, the failed rebellion’s supporters have slipped through his grasp to plot anew, bad luck plagues his every attempt to build Kiriath’s defenses…and that’s just the beginning. As the forces of the Black Moon advance toward Kiriathan shores, Abramm agrees to a desperately needed alliance-by-marriage with neighboring Chesedh. But with the hour for his union approaching, he is horrified to discover that he has become dangerously attracted to his fiancée’s younger sister, the headstrong Lady Madeleine.Worse, he learns his attraction is reciprocated–just the sort of situation his enemies can use to destroy everything he’s trying to accomplish. And Eidon just might let them succeed. Treachery and faithfulness, guilt and forgiveness, the joy of desires fulfilled and the pain of tragic loss all weave the tapestry of one man’s destiny realized–where mind-boggling blessings come wrapped in a mantle of suffering that will test Abramm’s faith to the limit and challenge everything he thinks he knows about himself and the one who owns his soul. Believed dead by all but the handful of supporters who rescued him from his Mataian enemies, Abramm Kalladorne has fled his homeland to the high mountains of northern Chesedh. Traveling under a new name with a group of bitter and increasingly desperate fellow exiles, Abramm hopes to reunite with his wife in Chesedh, where he will offer his services to her father in fighting the invading armies of the Black Moon. But with every step he is hindered, delayed and diverted from the direction he desires to go, and it soon becomes clear Eidon has other plans for him.